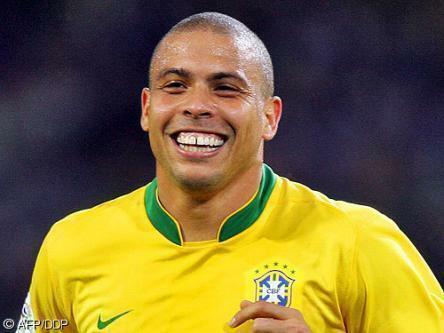 Ronaldo Luis Nazário de Lima was born on September 22, 1976 in Bento Ribeiro, Rio de Janeiro, Brazil. Born in a poor neighborhood of Rio de Janeiro in Brazil, he started playing soccer on the streets, with the rest of his neighborhood friends. At age 14, he decided it’s time for a little organization in his life as a soccer player, so he went on to train with the Social Ramos Youth Club for one year. His next youth team, Sao Cristovao is where Ronaldo made a name for himself, being spotted by Brazilian World Cup winner Jairzinho as a future talent. Jairzinho, who played for Cruzeiro Esporte Clube, recommended the young Ronaldo to the club and they signed him when he was 18 years old. His first and only season as a professional soccer player in Brazil was extremely successful, as he scored 12 goals in 13 games, quickly attracting the eyes of Europe. The first club to spot Ronaldo and make Cruzeiro an offer was Dutch PSV Eindhoven. Admittedly, not one of the mammoths of Europe in terms of soccer, but nevertheless a powerful club where a young player like Ronaldo could hone his skills and get some experience in Europe. 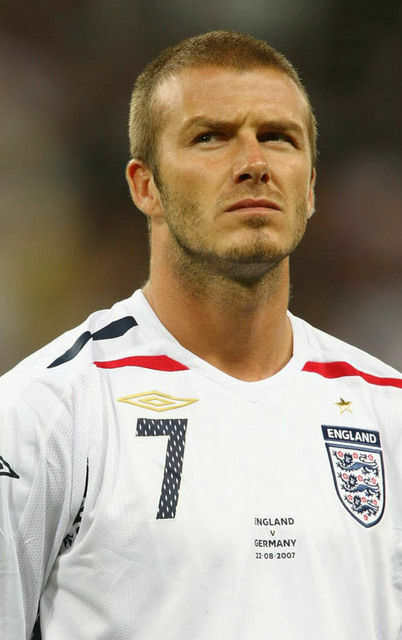 His 2 seasons at PSV were extremely successful, scoring 42 goals in 46 matches at just 21 years of age. His performances could not remain unnoticed and FC Barcelona moved in with a heavy offer to take the Brazilian on. 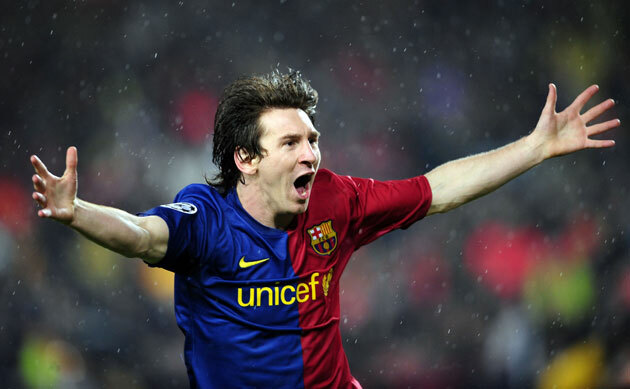 His only season with Barcelona would be one of the best of his career, scoring 47 goals in 49 matches in all competitions for Barca and helping the Catalan club win the UEFA Cup Winners Cup (He actually scored the winning goal in the final) and the Spanish Cup. This great season confirmed him as an outstanding player and a goal scoring machine and Internazionale Milano moved in to take the Brazilian to Italy.During the 5 seasons in Milan’s shirt, he managed to score 50 times, but his efficiency was a lot lower than for PSV or FC Barcelona, due to several problems. First of all, the tough defensive air of the Italian Serie A reduced his ability to use his lethal dribbles as often as he could at FC Barcelona or PSV.His personal issues with his girlfriends and wife, as well as a string of injuries also kept him from being as prolific as before. Nevertheless, he was loved at Inter and he helped the Italian club win the UEFA Cup in 1998, which is actually his only trophy with the club. In 1997 however, he became the European Footballer of the Year, European Golden Boot and after the UEFA Cup success, he was named UEFA’s MVP that season.Still, in 2002 after no league titles with Inter, it was time to move on and Real Madrid took him on to form the so called “Galacticos” team of super stars. For Ronaldo, Real Madrid was angel and devil alike. Used to the Spanish league and escaping the Italian one’s defensive toughness, he regained his scoring pace and in his 5 seasons with Real, he scored no less than 127 goals in 83 league games.He helped Real Madrid win the league twice, in 2002-2003 and 2006-2007, as well as the European Super Cup and Intercontinental Cup in 2002. Although he played well for Madrid, his past with FC Barcelona, his numerous injuries and news of him partying before and after matches, created a gap between the Brazilian striker and his fans. He also gained a few pounds, which decreased his stamina, speed and agility attracting the anger of Real’s supporters, after a poor 2005-2006 season. Not finding his pace at Real Madrid anymore, he decided to move back to Milan, but this time for Inter’s arch-rivals, AC Milano. Checkout the ASCII Art of Ronaldo in the below link. Please use Lucida Console font to view the art in Notepad. Before that in Notepad go to Format and Uncheck the Word Warp and then Go to Font and Reduce the Font Size to 3 to 4 pt. Use only Lucida Console Font. Robson de Souza (born January 25, 1984 in Sao Vicente, Brazil), nicknamed Robinho (Little Robson), is a Brazilian footballer currently playing for Real Madrid and the Brazilian national team. Robinho has earned praise for his expert use of the pedalada and field speed. He is widely regarded as one of the best young players in the world. Born in Parque Bitaru, a poor neighborhood of Sao Vicente, Robinho took to playing football when he had little other. At six, Robinho was taken on by Beira-Mar, a local escolinha, and they took the championship in his first year. Robinho was claimed to look just like his teammate Marcelo, the spanish fans called them “the two twins”. In 1993, at the age of nine, Robinho drew attention by scoring 73 goals for the Portuerios futsal team. Robinho joined the Santos youth program, at the time was overseen by Brazilian football legend Pele. Pele brought Robinho into the Santos FC youth dorms, where Robinho received his first regular schedule of three meals a day. In 2002, Robinho graduated to the Santos first team. His work at the front helped them win the Brazilian National Championships in 2002 and 2004, as well as place second to Boca Juniors in the 2003 Copa Libertadores. Robinho’s contributions to Santos attracted a great deal of attention from the top European football clubs. A world class player that looks to be on the verge of a European move. Robinho’s skill drew the offers of several European clubs, but it took the kidnapping of his mother in late 2004 to convince him to leave. On July 31, 2005, Robinho signed with Real Madrid for five years at $30 million and joined his fellow Brazilian internationals Ronaldo, Roberto Carlos and Jalio Baptista. He made his La Liga debut on August 28 in a 2-1 victory against Cadiz as a second half substitute for Thomas Gravesen. In his first season, Robinho scored eight goals, but the arrival of Josa Antonio Reyes has brought the length of Robinho’s stay into question. One of his most recent performances though, in the “El Clesico” against Barcelona, which he earned the Man of the Match award may have impressed Fabio Capello. It has been reported that on 12th February Robinho may be allowed to leave Real Madrid for a fee of $30 million at the end of the season. Meanwhile, Robinho backed again that decision saying he’d like to prove himself that he is capable of impressing his coach and teammates. 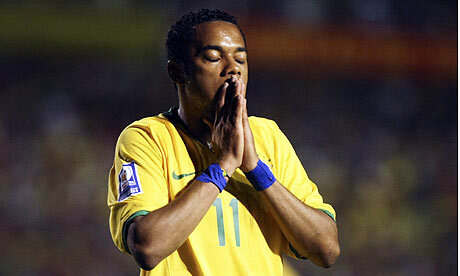 In 2003, Robinho was called up to join the prestigious ranks of the Brazilian national football team. 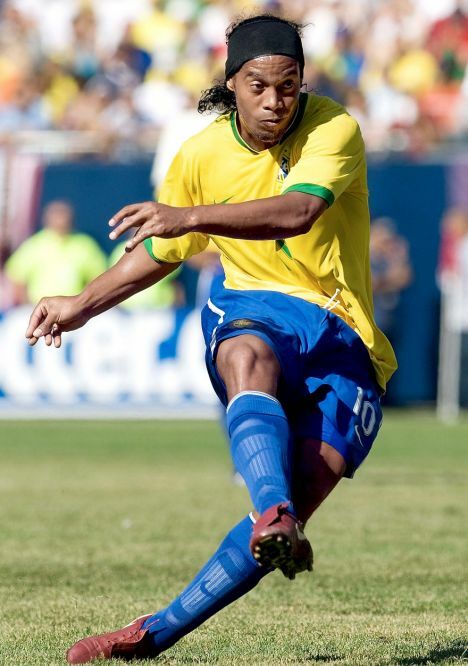 His first international appearance came in the 2003 CONCACAF Gold Cup final, where despite his team’s loss, Robinho displayed his talent on the international stage. Robinho played in each game of the 2006 FIFA World Cup group stage, but only started in the final game against Japan. Many fans say he should be on the starting lineup, but his small size is a disadvantage when playing against bigger players. However, whenever he had the playing chance he showed impressive signs and managed to dribble past even the world class defenders. Like many talented young Brazilian footballers, Robinho has been compared to his nation’s great players by both fans and the sports media. Robinho’s footwork and mercurial speed has many believing that he can carry on the mantle of Pele, Garrincha and Romario in Brazilian football. As of late, fans have also begun to foment a potential rivalry between Robinho and Argentinian striker Lionel Messi, who has been hailed as a wonderkid in football, and therefore a natural counterpart to Robinho. Contrasts between the two include the fact that they each represent rival Latin American football powerhouses (Brazil and Argentina) they play opposite each other in the premiere rival clubs of La Liga (Robinho for Real Madrid and Messi for FC Barcelona) and interestingly, there are the comparisons to the greatest living footballers in the world (Messi has been hailed by Argentinian fans and media as “the new Maradona” and Robinho with Pele). He has never gone on record to say his club football desires, yet there has been speculation that he would like to go to either Italy or England in the future. Checkout the ASCII Art of Robinho in the below link. Please use Lucida Console font to view the art in Notepad. Before that in Notepad go to Format and Uncheck the Word Warp and then Go to Font and Reduce the Font Size to 3 to 4 pt. Use only Lucida Console Font.